As highlighted at the Mutant Crawl Classics Kickstarter, there are some free downloads you can use to get an early look at MCC. Come to think of it, there ares some more Free DCC RPG releases. I'll link them in a follow up post. Always a Kerfuffle at The Tavern - Some More Thoughts on Free RPG Day. but the reality is, he's right - Free RPG Day does nothing to bring anyone into the hobby. Not new gamers, not lapsed gamers, not even gaming spouses (unless they are tagging along to grab more free loot). Now, here's my question: What value does Free RPG Day have for most publishers? Aldo mentions the free Call of Cthulhu adventure later in the interview. 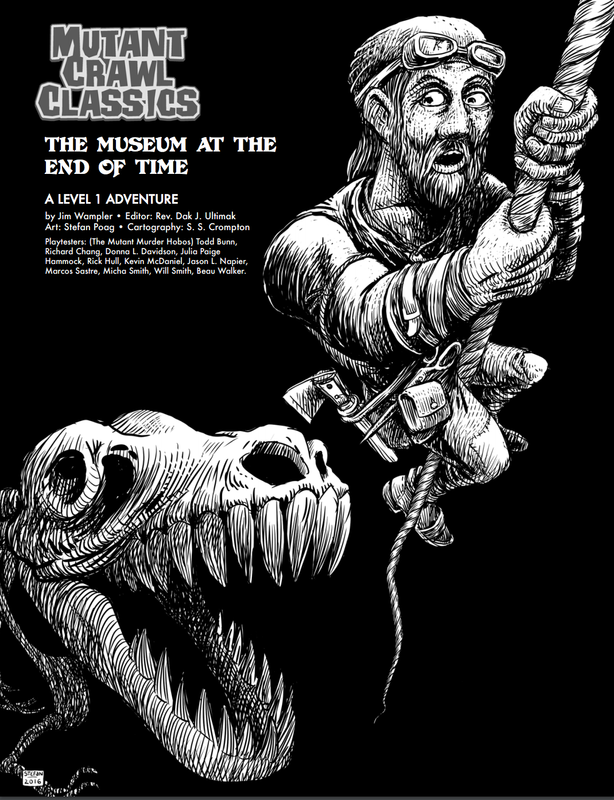 How many brick and mortar stores that had the free adventure actually carry the game? 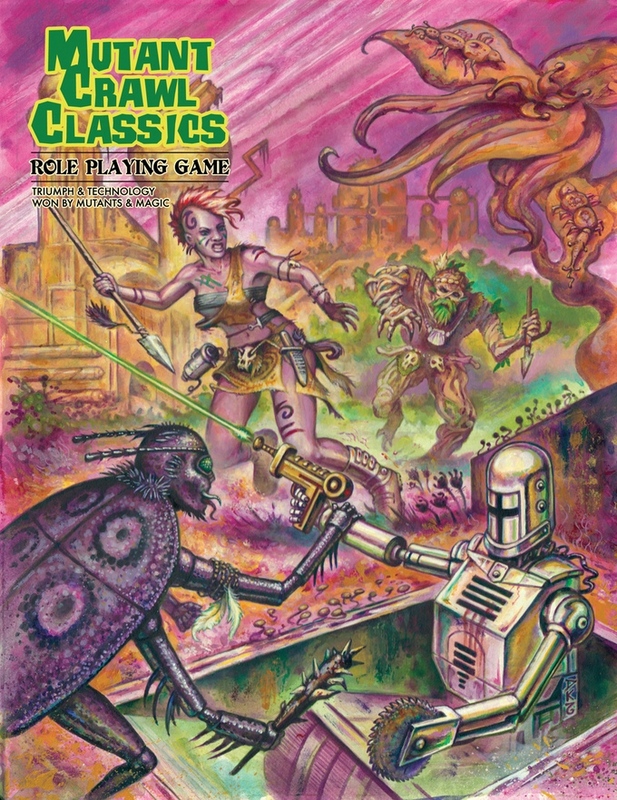 How many carry the DCC RPG? 13th Age? LotFP products? Castles & Crusades? How are you rewarding your customers by giving them free stuff for games you don't even carry? As a retailer, you know what's coming in the box. Why aren't you at least carrying a product or two that links to the items you are giving away? Because you probably figure they won't sell anyway. If so, what good are the free items? At best, your customers will pick it up as a novelty. At worst, they'll find what they need at an online retailer. Is that really what you want? 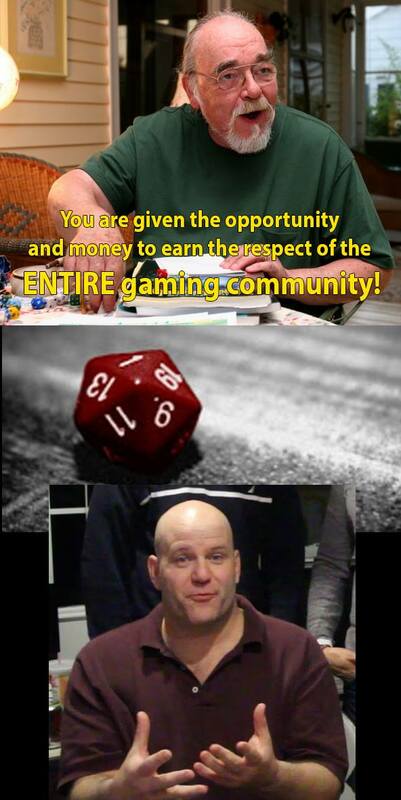 I really fail to understand why most publishers kick into this program aside from Paizo. I do understand why Frog God Games didn't release anything this year. It's not even a "loss leader" for most publishers, it's just a loss, especially when the stores in question don't even carry your line of releases. I'm not knocking "free", I just don't see this as a very effective use of the concept. Not for publishers, not for retailers and not for the customers. Spell lists are whittled down, but again, new spells from the various Swords & Wizardry rules can be introduced via adventures. I am considering an optional Deadly Machinations four page pamphlet, which would offer GMing advice, sample magic items, random encounter charts, adding in alignment and languages and other ways to get your PCs in trouble. For the folks looking for a Thief class, this would be where they'd make an appearance, assuming they did. The whole key to this is keeping the releases at four pages, so you can print it on one sheet at booklet settings. 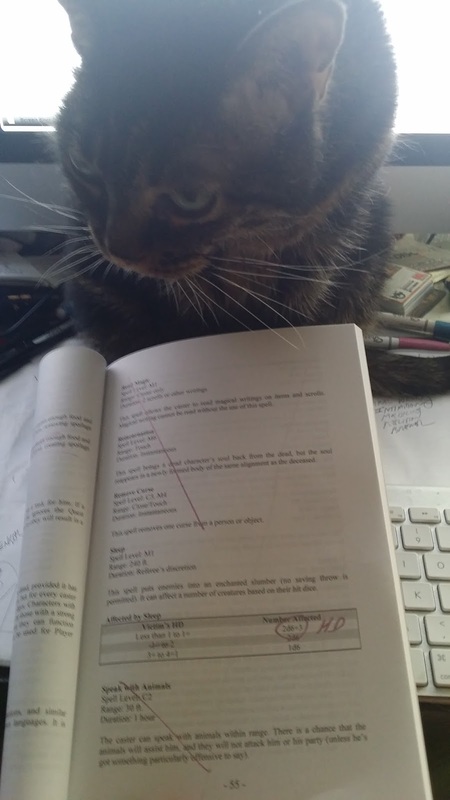 At the moment, I've distilled S&W Basic down to six pages for S&W Light. This is the first pass, there are still some tables that need editing and there is a bunch of stuff that needs rewriting for space and explanation purposes. BTW, that's 6 pages using the Word document. Laid out properly it's probably around 4ish. 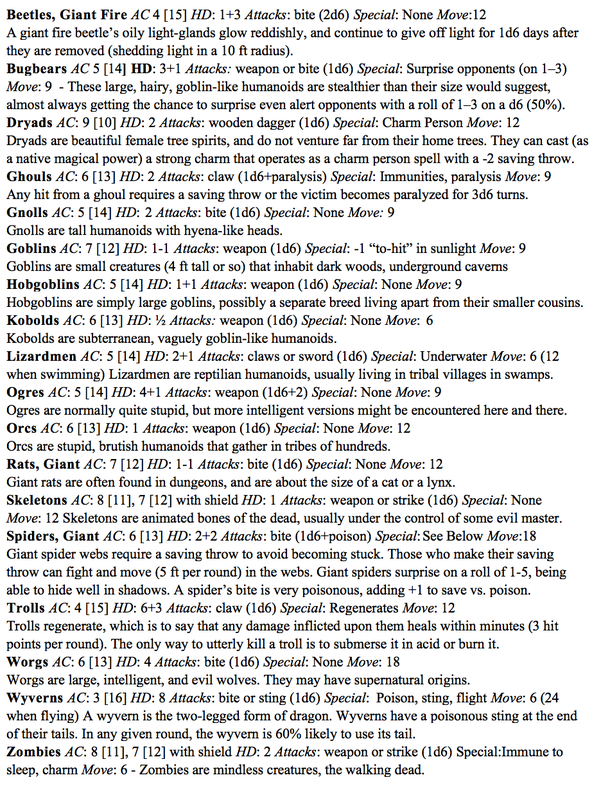 All 18 included monsters fit on one sheet. Most monsters took 2 lines but a few took 3, such as the Giant Fire Beetle. 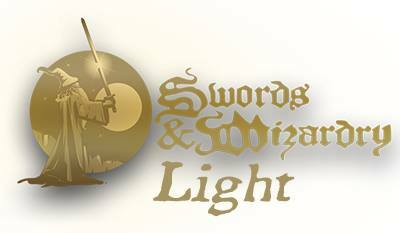 I've been "red lining" a spare copy of Swords & Wizardry White Box for the S&W: Light project I'm working on. I stumbled across the Sleep Spell table, and noticed something wrong with it. Two somethings actually. "1+" is on both the first and second line of the chart and "2+" isn't even taken into account. Now, for the purpose of White Box, I'd probably change the first line to "Less than 1 to 1" and the second line to "1+ to 2+". For S&W Light, I want to save space and do away with the chart all together. 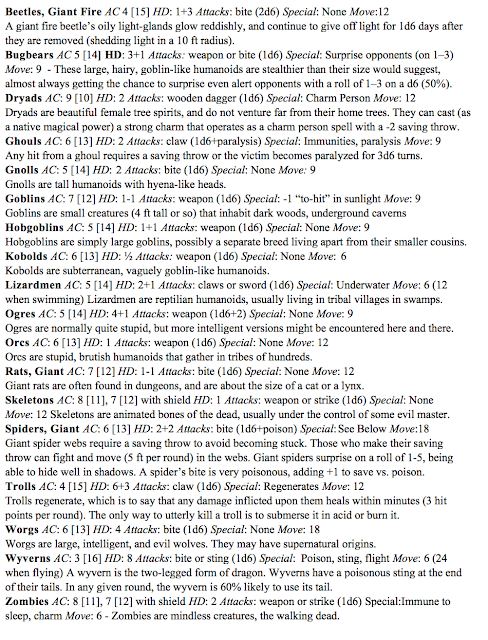 So, I'm going with 2d6+3 HD of creatures, with less than 1HD counted as 1HD and ignoring "+'s". Any HD that can't be fully allocated are lost. Takes into account mixed groups fairly well and does away with the chart. It's Wednesday, so tonight is another Tavern Chat. Swords & Wizardry: Light and whatever else your little heart desires. Girl Downtown has up and Gone! Quick Ken! Start Up Another! Yep, it appears the fundraising for Girl Downtown has up and gone. Ken, what's the next scam? 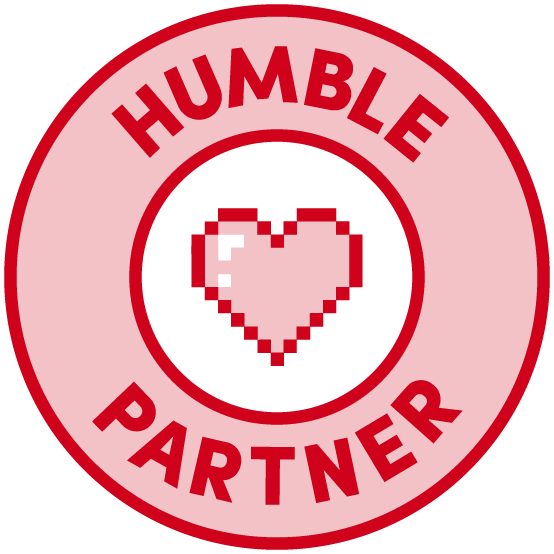 +Jason Paul McCartan , AKA The Badger and well known as my partner in crime, is celebrating the 2nd anniversary of his RPG News website, OSRToday. Pssst! And he's has a contest to give away free loot. 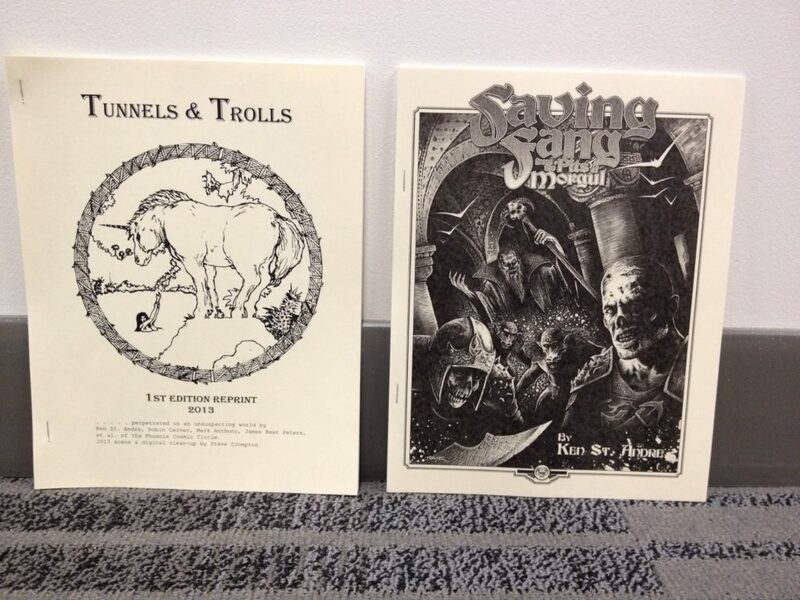 Tunnels & Trolls loot, signed and personalized by +Ken St. Andre himself. How might you come into possession of such sweet loot? In the picture above, you can see reproductions of the 1st Edition of Tunnels & Trolls [AL] and Saving Fang From the Pits of Morgul [AL], the first full solo adventure for the 1st Edition of T&T . Both of these have been signed by Ken St. Andre, who very kindly personalized each of the inside covers of each of these books at Origins 2016. What did Ken write inside them? That’s a secret that will only be revealed once the competition is over and one lucky winner has received these books. So, how do you, our diligent OSRToday readers, get a chance to win both these books? Simply post in the comments here on this post (at OSRToday mind you) either your first experience with Tunnels & Trolls or your first roleplaying game experience either as a player a GM, even if it’s not with Tunnels & Trolls! Everyone that posts at least one story by the deadline for the competition will be entered into the Hat of Potential Winners, and one lucky winner will receive both copies of the books shipped to them no matter where they are in the world, courtesy of OSRToday. The deadline to comment on this post will be midnight on July 6th, 2016, which is two weeks from when this post has gone up. What are you waiting for? Go to OSRToday, drop a comment and get put in the running. Thanks to +Lloyd Metcalf for the share. It's a perfect Ken pic, with that smug smile we know so well. A while back I stumbled across a really good deal on Swords & Wizardry White Box softcovers. I ordered a half dozen with the intention of giving out copies to my old face to face gaming group at our next annual gathering. Once I got them, it was kinda obvious they weren't being sold by Matt or Mythmere Games. I wish I had paid closer attention. I wasn't going to hand out bootlegs, but throwing away gaming material felt like just compounding a bad situation. So, I put them on a shelf and there they sat. Until now. Now that I'm working on what is tentatively titled Swords & Wizardry: Light, these books are a boon. I get to "red ink" - in metallic no less - a hard copy of White Box. It's actually a thrill to go through and trim what isn't needed. The idea is that some of the material trimmed could be added back in a series of adventures. The same adventures that will be written to help a lapsed gamer regain his game mastering footing. 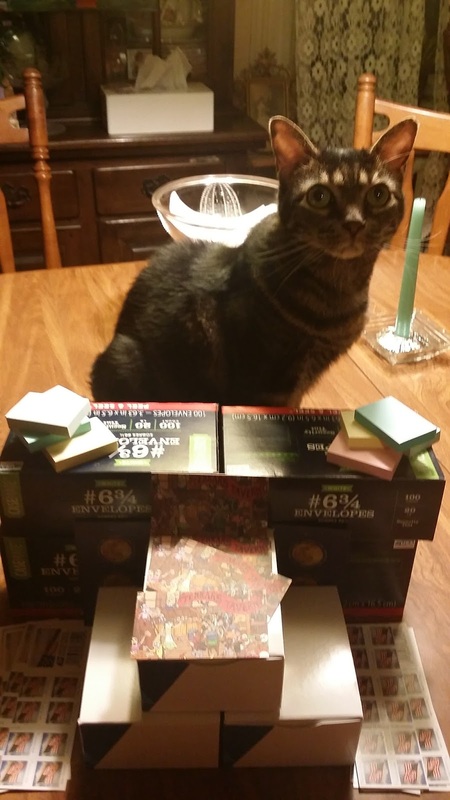 Time to Start Processing Tavern Card Requests - Ashley Demands it Be So! 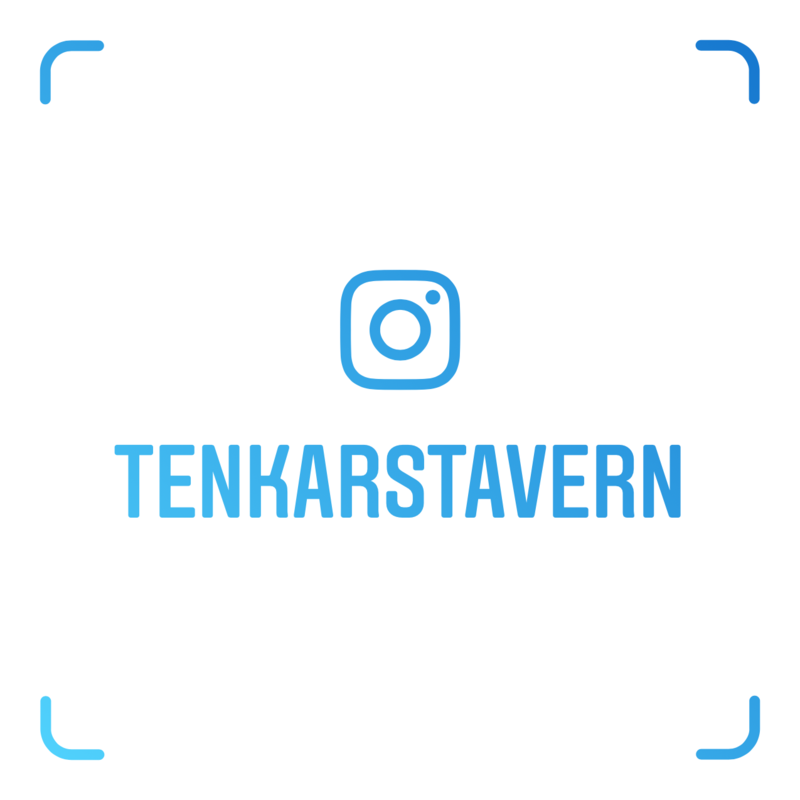 500 extra heavy Tenkar's Tavern Membership cards - check! 400 peel and seal envelopes - check! 300 US Postage Forever Stamps - check! 30 US Postage Global Forever Stamps - check! A bunch of mini post it's for personal notes - check! Back home to my desk, refreshed and rejuvenated. I've got 20 requests to catch up with for The Tavern Membership Cards from the weekend, so there's some work to do. I also plan to start posting the rule modifications and the like to The Tavern's Google Community either later tonight or tomorrow. In the meantime, I've got the intro hook for S&W: Light (working title for now). The intro will certainly go through revisions, but does a decent job (INHO) of potentially evoking memories in lapsed gamers (which I think is a more viable target audience than totally new gamers). Remember the days of yesteryear? When battles were won with sharp swords and well timed spells. When wit and daring could overcome most odds, and when they couldn’t, fast feet were worth more than any gold coin. These four pages of Swords & Wizardry: Light will awaken the long forgotten gamer in you with a call to arms! What are you waiting for? It’s time to roll them bones! I'm in the Poconos for an extended weekend with Rach and my parents. 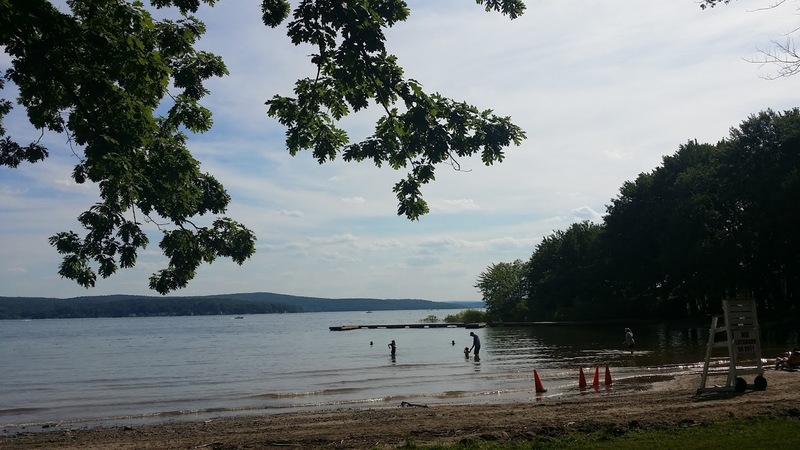 I"m still amazed I spent nearly 10 months without spending a night out of the city. For me to create and create effectively, I need to be in the right mindset. Nature not only recharges my batteries, but it invigorates my mind. I did a lot of brainstorming last night for the Swords & Wizardry 4 page / 1 sheet project. I need to update the Google Community with some of the changes / solutions that are likely to be used. Now, a question that can come now or later, but must be addressed at some point is what do you call rules that are lighter than S&W White Box? If you are part of The Tavern's Google Group Community, then you already know. If not, I'm now announcing it at The Tavern. I've been brainstorming with a writer / publisher to distill Swords & White Box down to four pages, printable on one sheet of paper in digest form. 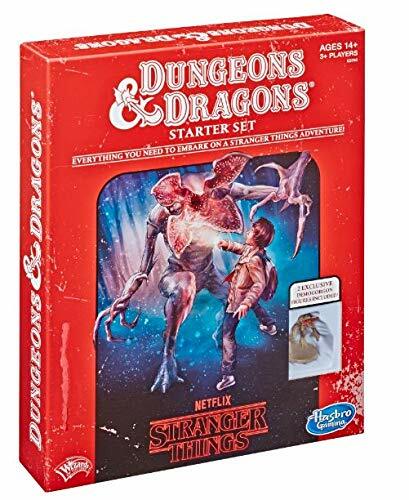 This all came about with the conversation on Friday that A) OSR games are under represented on Free RPG Day; B) Free RPG Day isn't about growing the hobby but rewarding the current customer C) it's damn expensive for any publisher to participate in Free RPG Day. What if you had a self contained OSR ruleset in 4 pages, that covered the core 3 classes, the first three levels of advancement, was able to be played WITHOUT a D20 if needed and was aimed not so much as the new player but the lapsed gamer? You now, what I was from 1997 to 2006 or so. Free in PDF, printable at home, made to be evangelized. Leave a dozen copies at the game store or library, printed on colorful paper to grab the eyes. Maybe leave a stack at a comic con. Wherever you think a lapsed gamer may find it. 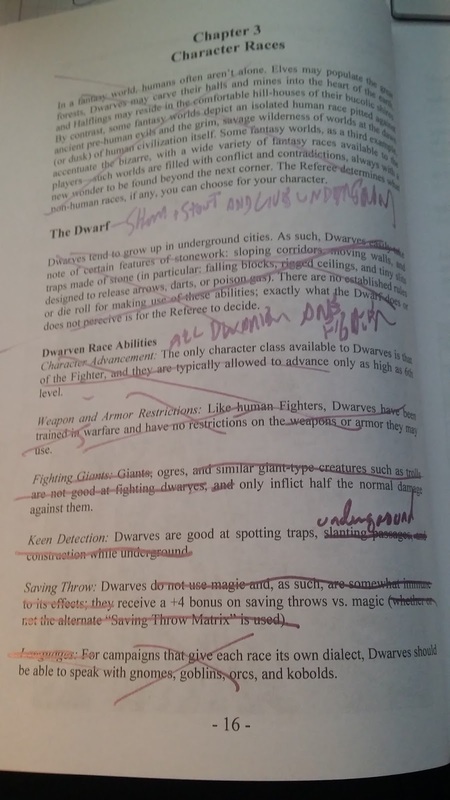 Maybe left with different community written 4 page / 1 sheet adventures. Compatible with Swords & Wizardry White Box and written that any of the Swords & Wizardry Rules are a natural progression, it's aim is to be the re-entry engine for the lapsed gamer. Brainstorming has gone well and there is a lot to trim to bring this down to size but I think it can be done, and done effectively and still approachable and readable. Something that Rach, who it loathe to read any RPG rule book will look at and not feel intimidated by. Progress reports and rules in progress will be posted on The Tavern's Google Community Group. There will be updates posted to the blog, but the bulk will be in the Community Group.